Police say they've made an arrest in the savage beating of a man in Borough Park. Lori Bordonaro reports. 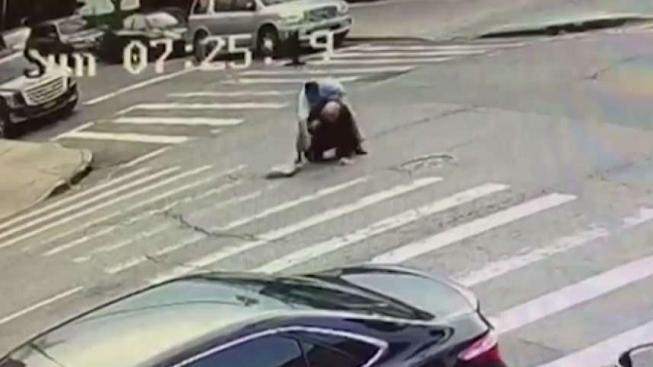 A man was charged with assault as a hate crime in a beating of a Jewish man in the middle of a Brooklyn street on Sunday morning, officials said. Farrukh Afzal, 37, of Staten Island, was arrested and charged with assault as a hate crime, criminal mischief and harassment, the NYPD said. Police said they found him beating a 62-year-old man at 46th Street and 13th Avenue in Boro Park. The victim, Lipa Schwartz, is an Orthodox Jew who was walking to a synagogue for prayers when he was attacked, said state Assemblyman Dov Hikind, a Democrat who represents the neighborhood. Schwartz told Hikind that the attacker spoke another language and the only words he understood were "Allah" and "Israel," Hikind said. Schwartz and Hikind appeared at a news conference together, but Schwartz was more comfortable speaking Yiddish. Schwartz was taken to Maimonides Hospital in stable condition with cuts, pain and bruises to his head, police said. Hikind said a second man was attacked when he approached to help. “Watching the video of the incident or just hearing about it is traumatizing—especially to children and the elderly here, many of which survived the Holocaust," Hikind said in a statement. It wasn't immediately clear whether Afzal had an attorney. The Anti-Defamation League said there have been 11 anti-Semitic assaults in New York State this year and eight of them were in Brooklyn.